Doors 7:00 pm - Musical starts 8:00 pm promptly! 1. (Matt/Taylor/Brian) - Indiana Jones, swashbuckling archeologist, leads a small expedition through trecherous Peruvian jungle. Stealing a golden idol from an ancient temple cave, Jones barely escapes with his life. 2. (JL/Ev/Sh) - Rival archeologist Belloq, leading an army of natives, captures Indy. Belloq takes the idol, but Jones escapes. 3. (Liesa L.) - Back in the US, Jones gives an archeology lecture to a classroom full of adoring coeds. 4. Government agents ask Jones about his mentor, Abner Ravenwood, who may have the Headpiece of the Staff of Ra. Hitler's men have found the ancient city of Tanis, and want the relic to help them locate the Well of Souls - resting place of the lost Ark of the Covenant. 5. Hoping to recover the Ark himself, Indy takes a slow airplane journey to Nepal. 6. Marion Ravenwood wins a drinking contest in the saloon she owns. Indy arrives and offers $5000 for the headpiece. She is still bitter about their failed love affair a decade earlier. Nazis arrive, demanding the headpiece. 7. (MJ) - Indy rescues Marion, but the violent battle burns the bar to the ground. Marion demands a partnership. 8. (S&P) - A slow plane flight takes Indy and Marion to Cairo. Indy and Marion are welcomed by Sallah, a digger for hire in Cairo, and good friend of Indy. 9. (JK & friends) - On a crowded Cairo street, Indy is attacked by a local gang. Indy fights off the attackers - but a truck explosion appears to kill Marion. 10. (David & Elisabeth) - Drowning his sorrows in a bar, Jones confronts Belloq about Marion and the Ark - but is led away by Sallah's children. 11. (Jay/Martin/Evan) - A local cleric explains the symbols on the headpiece. The Nazis, they realize, are looking for the Ark in the wrong place. 12. (Eric & Meghan) - Indy slips into the map room and uses the Staff of Ra to locate the Well of Souls. 13. Indy discovers Marion alive, held prisoner - but rescuing her would ruin the mission. 14. As Indy & Sallah begin their dig, Belloq attempts to woo Marion, who tries to escape by out-drinking him. 15. (Eric & Meghan) - Indy & Sallah open the Well of Souls - and find it filled with snakes. They uncover the Ark. 16. Nazis interrupt Belloq & Marion - and soon discover Indy's team at the Well of Souls. 17. 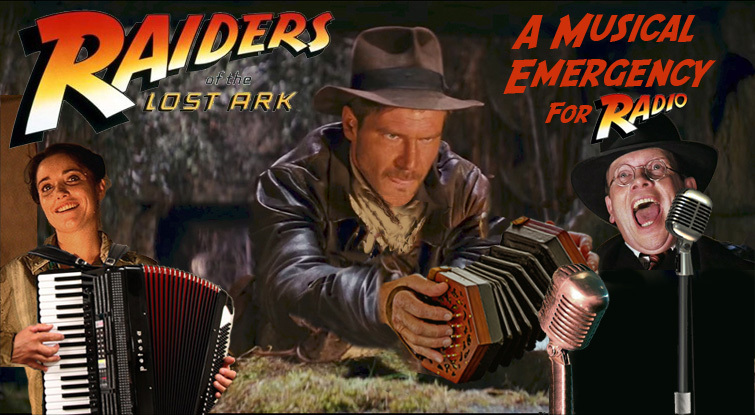 The Nazis take the Ark, throw Marion into Indy's arms, and seal the two within the Well of Souls. 18. (Martin) - Indy escapes by toppling an ancient statue. 18b. They emerge above an airstrip, where they fight two pilots and cause more explosions. 19. The Ark is carried away by truck. Indy steals a horse, battles dozens of foes, and arrives with the truck in Cairo. 20. Indy, Marion and the Ark ride on a pirate ship. At last, they share a quiet moment - until Indy falls asleep. 21. Nazis soon board the ship, claim the Ark and kidnap Marion. Jones escapes - but stows away on the submarine. 22. (Dan A.) - As Belloq prepares an elaborate ritual, Indy threatens to destroy the Ark - yet Belloq convinces him to surrender. 23. (PBJB) - With our heroes bound in place, Belloq and the Nazis open the Ark. Mysterious horrors consume them in supernatural flames. Indy & Marion shut their eyes - and miraculously survive. 24. (Craig) - At the Pentagon, beurocrats dismiss Indy's concerns about the Ark. "Top Men" are handling the relic. 25. Deep within an endless government warehouse, the Ark disappears into a mountain of identical crates. 26a. (Jay) - Faux-vintage radio commercial jingle #1! 26b. Faux-vintage radio commercial jingle #2! contact Martin and we'll work something out. Copyright 2017 by their respective performers. All rights for the songs are reserved.